Easter is under a month away and I’m just getting my act in gear. Pretty soon it’ll be Christmas. Kidding! 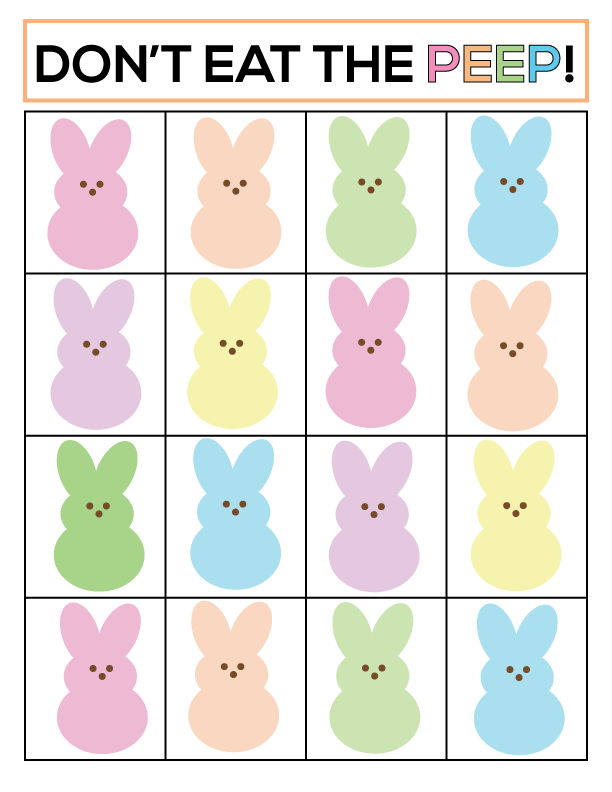 But really — this cute little Easter game to celebrate the holiday. In the past I made up “Don’t Eat the Chief” to celebrate Presidents Day. 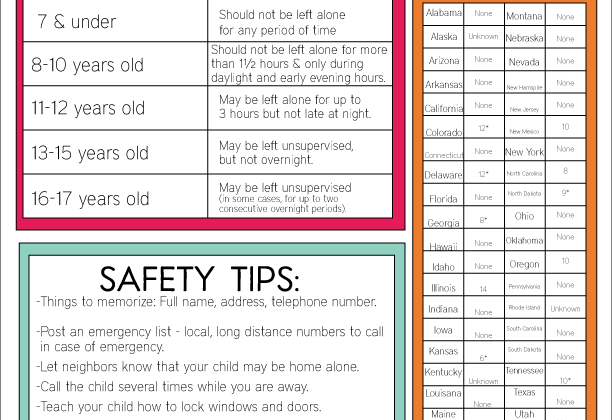 It’s an easy and fun way for kids to learn the presidents of the United States. I thought it’d be fun to make an Easter version. Print out the game board (below) and disperse candy, cereal pieces, pretzel bites, anything you want. Have one person leave the room while the other players arrange the food on the board. One piece in each square. Everyone chooses 1 “peep” (square with candy on it). The person then comes back into the room and picks a square, one at a time, eating the candy. 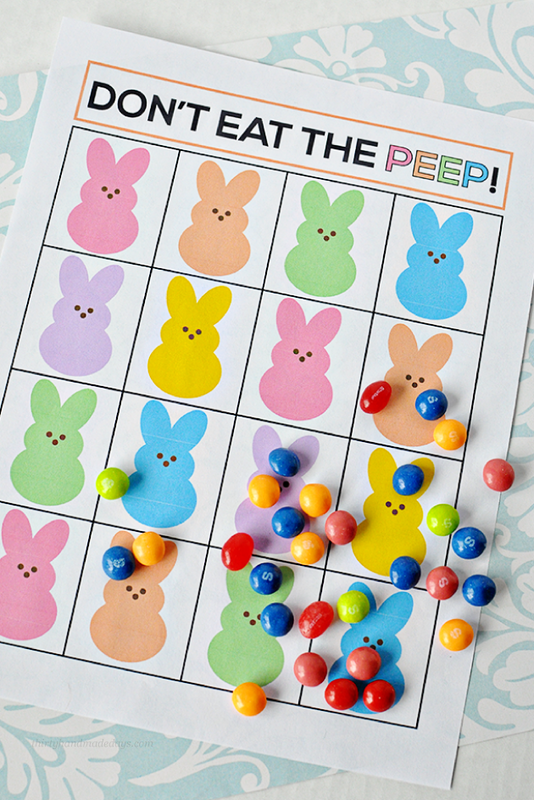 When he or she picks the “peep” everyone yells “Don’t Eat the Peep!” Continue until everyone has a turn. This game is best for younger kids. They get into it and think it’s hilarious when someone eats the peep. 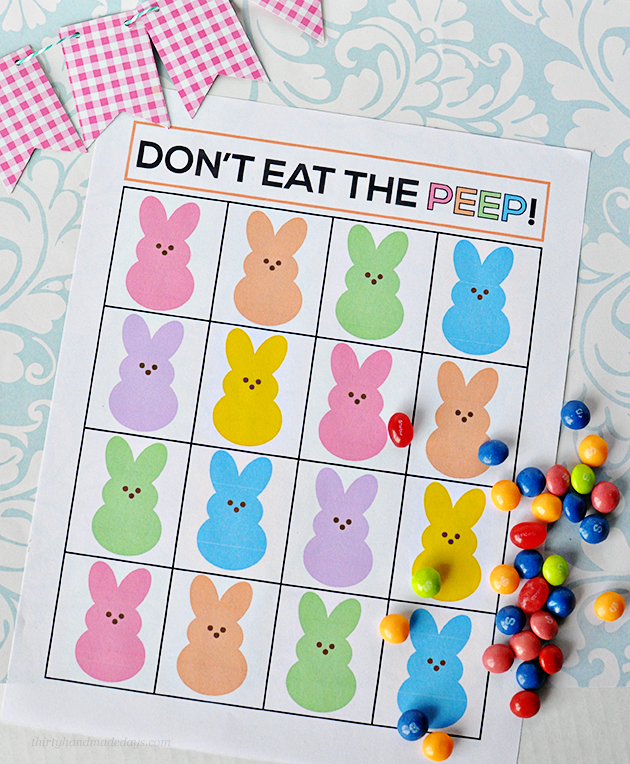 Download this “Don’t Eat the Peep” Easter game. For personal use only. Thanks! What a cute game Mique! My family is going to love this:) Pinned! So cute. This is a must do with my girls! Cute game – pinned it! 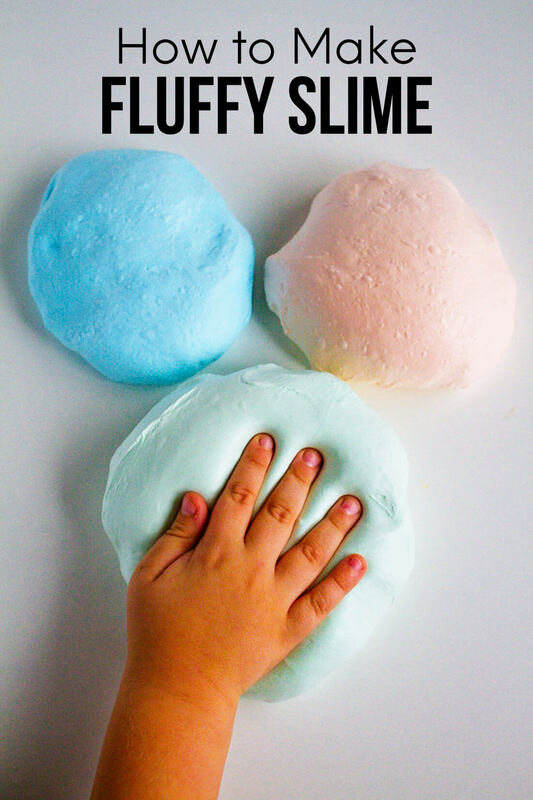 This will be perfect for Easter Sunday…I teach the 2-3 year old children. Nothing like getting them full of sugar before they have to sit in church! :) Thank you for the game. Yep, the cutest. LOVE it! Of course yours is much cuter than mine, I just did mine in word…it was 4 years ago– I have a lot of hidden “gems” on my blog in the archives. I recently had twins so I haven’t blogged for a while. I guess great minds think alike!! Just not at the same time :) Thanks for sharing! I love the budget binder!! 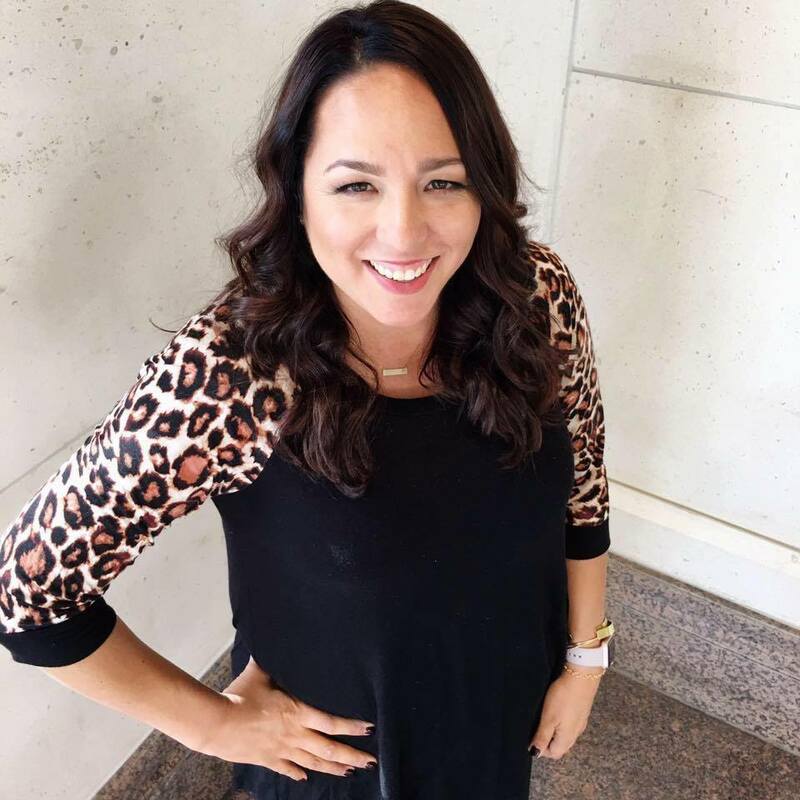 Hi Sharla- so fun! I wanted to do some more printables for Easter and did a variation of “Don’t Eat Pete” for Presidents Day a couple of years ago so I designed this one off of that in Illustrator. I started 30days in 2007 so there’s lots of stuff hidden on here too- I totally know what you mean. ;) Thanks for the comment. And congrats on having twins! I don’t think you meant Valentines Day did you? Anyhow, this sounds fantastic, can’t wait to check it out! what a fun idea, love it! pinning! Such a cute game! Looking forward to pinning Sunday! Thanks Glenna! Looking forward to Sunday too.